One of the very best things about golf is that it’s a sport for all, whether you’re young or old. It’s possible to keep playing golf into old age, and it’s possible to continue to play at a high level. Of course, as we age, our limitations shift and we must adapt our game accordingly. Here, we look at seven key training tips for senior golfers. The starting point of a solid golf game for all players is strength and flexibility. But as we get older, maintaining solid core strength and flexible muscles takes a little more effort and dedication. You don’t need to become a fitness fanatic, but 15 minutes of simple exercising and stretching per day could make all the difference. Many older golfers suffer from back pain and, often, this stems from a weak core. If this applies to you, you should visit a sports physiotherapist with a view to establishing a brief daily routine to strengthen the abdominal muscles for golf. Planking exercises are good, or you could simply lie on your back and lift your heels a little off the floor – start gently and build it up. If you can strengthen your core, you’ll improve your balance and stability through the swing, thereby increasing consistency. It’s the same in terms of flexibility: Find a short programme of stretches that suits you and enables you to loosen your muscles each day. Remain limber, swing more freely and play better golf. The golf swing engages an array of muscles and the best way to exercise them is to continue to repeat the action. We all know how stiff we feel on the first tee after an extended break from the game. Let’s use swimming as an example – if you go for a swim for the first time in six months, your body will ache for a few days after. However, following four or five swims in a couple of weeks, your body will begin to strengthen in the right places to make it a less painful experience. Golf is the same – keep swinging a club and you won’t lose strength in the key areas. Even if it’s just having a few swings in the garden, or hitting an air-flow ball, try to make a golf swing at least a few times every day. Golf is not about how, it’s about how many. It doesn’t matter what the swing looks like as long as it delivers effective results. Find a swing that produces consistency. Simplify the action and shorten the swing – back and through in a straight line is far better than flailing about on a variety of different swing planes. Not only will a simplified “go-to” swing minimise mistakes, it will also minimise the risk of injury. 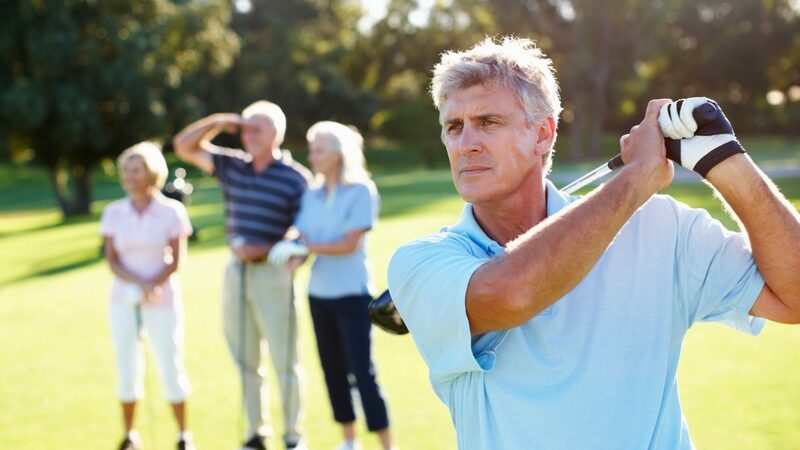 As we get older, we will inevitably lose a little clubhead speed. But we can still continue to find distance through improved timing and making a clean contact with the ball. When you’re practising, think about timing rather than power. A rhythmical swing that consistently delivers the clubhead neatly and accurately to the back of the ball will produce better results than a fast-moving clubhead that makes a glancing blow. Although practice is important to continue swinging, spending an hour at the driving range bashing balls aimlessly into the blue yonder isn’t going to help you improve. It’s tempting when you practise to hit the shots you know you can, but is that really going to help you improve? We all know where we struggle on the course and this should be the focus of a good proportion of any practice sessions. If you have always been a good driver of the ball, you can trust that you always will be. But if you know your wedge play could be better, dedicate some time to that. You might not be able to hit the ball 275 yards anymore, but you can still hole a putt or nestle a chip by the pin. Short game is an area that senior golfers should really focus on – become a short game wizard and you will still score well. Hopefully these tips will help you play at a good level for as long as possible! Are there any tips we haven’t covered? Let us know by leaving a Comment below or tag us on Facebook or Twitter!